My City in Ruins, originally written for the singer's favourite town of Asbury Park in New Jersey, was dedicated instead to New Orleans. And reflecting the city's jazz influences, he ended his performance with When The Saints Go Marching In. 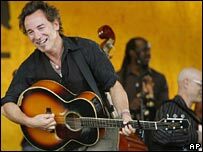 Springsteen was joined on the bill at the festival by other high-profile acts including Bob Dylan, the Dave Matthews Band and Elvis Costello. The annual event traditionally draws around 400,000 people and boosts the city's economy by up to $300m (£165m). It is being held at a racetrack on the northern side of city that was underwater eight months ago and continues next weekend.